Two walls stood as a blockade to the entrance of Malcolm X Plaza. Students were asked to show their SF State identification before passing through to the Cesar Chavez Student Center to convey the eerie feeling of a borderland territory. This demonstration was brought about by Israeli Apartheid Week organized by the General Union of Palestinian Students SFSU (GUPS) and La Raza Student Organization on March 6, between 12 and 2 p.m.
Israeli Apartheid Week is an annual international series of events in cities and campuses with the intent of educating people about the segregation system in Israel and to build Boycott, Divestment, and Sanctions (BDS) campaigns as part of a growing global BDS movement. “These walls are a mock wall of the apartheid wall and the border between the United States and Mexico. 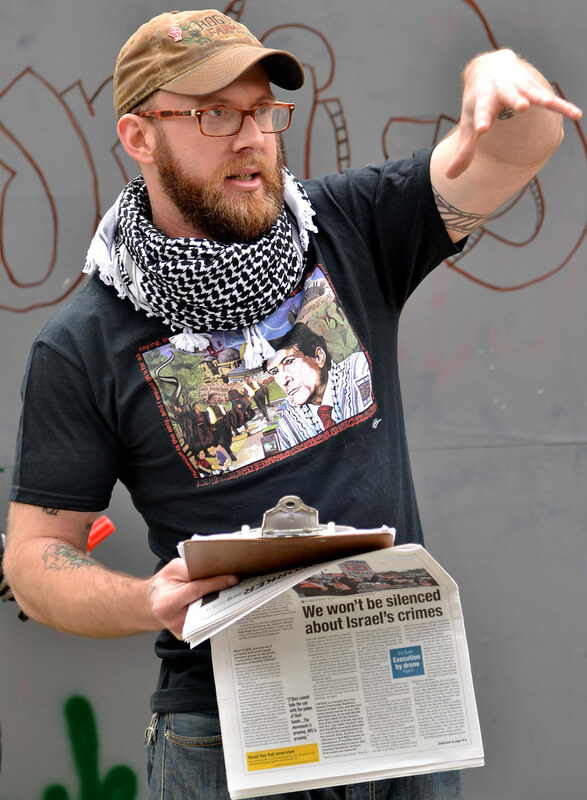 We partnered up with La Raza, we came together to build a wall that represents both of the borders that divide our peoples,” Zachariah Barghouti, co-president of GUPS, said. Barghouti, a 27-year-old international relations major, believes the similarities between the walls built along the United States, Mexico border and the walls built in Israel are alike in that they stand for the same reasons. GUPS and La Raza have had a long standing relationship as history has shown. “(GUPS) have always supported us in our cultural events and whenever they needed our support, if we felt like it was something we agree with, then we do everything in our power to offer our support,” Tomás Ortega, La Raza organizer, said. Ortega believes that the two cultures are fighting the same battle. Representatives from the I-Team, formerly known as the Israeli Coalition, believed the demonstration was a bit abrasive. Former president of the Israeli Coalition, Samuel Boikaner, felt the demonstration was too much. “It’s pretty sad, in my opinion this is very offensive towards my side,” Boikaner said. Although many representatives from I-Team did stress they were not there to show sides, but to keep students informed. Ortega believes the approach was just right. Students passing by didn’t seem too bothered. Tony Flores, senior and history major, thought the demonstration was educational. March 7 will mark the last scheduled event led by the student organizations. “Photoshoot For Justice” will take place at Malcom X Plaza at 10 a.m.